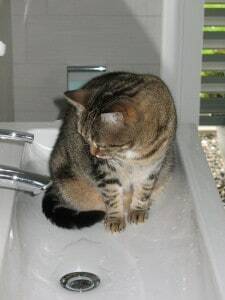 If you’ve noticed your cat scratching relentlessly, chances are s/he may have…yep…..….fleas. “NoOoOo!” Yeah, trust us, we know too. But don’t worry, we’ve got you covered. This JUST happened to us, and being in Nepal, where cats-as-pets is a fairly new idea, coming across products to get rid of those nasty fleas is not easy to come by. That’s why we made our own homemade flea spray for cats. And so far, so good! In addition to learning how to make a homemade flea spray for cats, read our article on ‘How to get rid of fleas on my cat‘! The first rule in making a homemade flea spray is being proactive. There also needs to be some understanding that fleas will eventually adapt to your spraying methods and find some new way to become dormant until the time to jump presents itself again. Having patience and being committed to getting rid of fleas will leave you with one big bowl of success in the end, and let’s just say it is well worth the effort. That’s why we recommend doing a variety of natural remedies to get rid of fleas on your cat. What I mean is combining your creative and strategic methods to make you one super awesome flea killer. It is OKAY if your cat licks some of the spray off his fur. This recipe is strong on fleas but will be gentle on your cat. Some people recommend adding vinegar to the cat’s water but please do not do so. An unhealthy level could be ingested and it is really not safe and could result in digestive problems. Applying it to your cat’s skin, aka through a spray bottle is completely fine. 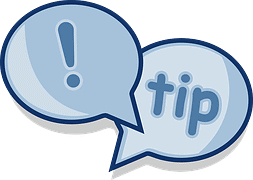 If your cat licks it once applied on the fur it will only be ingested slightly but it will not alter your cat’s pH level. You can also use this spray liberally around your home. However, what you could also do is make two separate sprays. One that is gentler for your cat, and one that is specifically for your home that is loaded with vinegar and lemon. 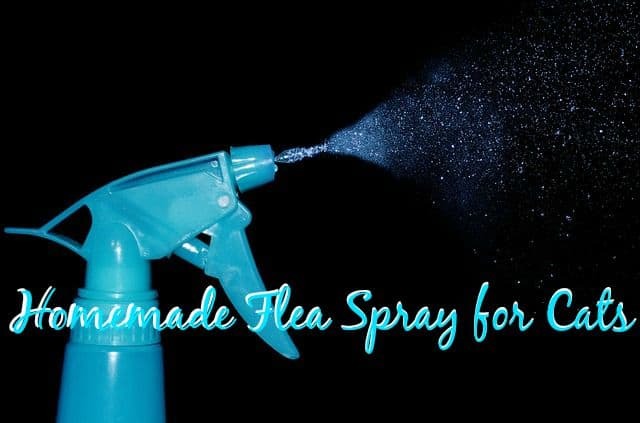 Ingredients > homemade flea spray: Home use only! This is the same process as the recipe above, except double up on your usage. *Salt can also be applied directly to floors/carpets or any area your cat normally lays. 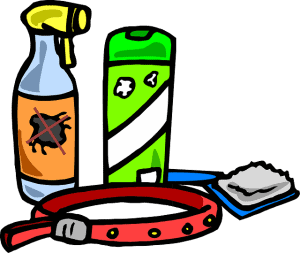 Just shake salt directly onto the floor, it is a natural flea and flea egg killer. This solution is MUCH stronger and should only be used to apply around your home. 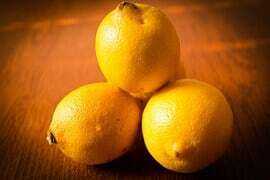 Vinegar and lemon/citrus act as a natural flea killer. However, as mentioned above, you should be proactive in your flea hunting. While these solutions ARE effective, you may need to do this while doing other natural remedies for getting rid of those fleas. 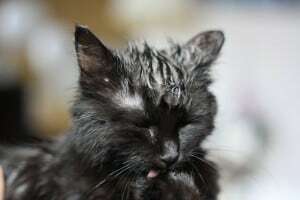 Give your cat a bath! But, seriously. You will half the amount of fleas on your cat by doing this. If your cat freaks out from water (luckily, Yoda is super awesome and calm) then this may not be your top priority. Even if you cannot succeed at lathering up your cat with a soapy mix to suffocate the fleas, then at least get his fur wet. Hold the back of your cats neck like a mommy cat would hold it’s baby. Then slowly and gently cup handfuls of warm water onto his fur. This way your cat won’t even really know he’s going to be completely drenched. Offer treats, too! Once you get your cat’s fur wet, you will be able to see straight to the cat’s skin. This opens the door to a hundred fleas. Sit your cat on your lap with a towel beneath them and grab some tweezers and a bowl of water with a drop of solution, or soap, anything. Search through the fur! You will easily be able to see the dark fleas up against the cat’s white skin. Quickly surround the flea with your fingers, acting like a cage, and grab the flea with a quick snap of your tweezers. Put the flea in the bowl of soapy water to drown them. Repeat. Disgustingly, after giving Yoda a warm, lathery, soapy bath, believing we had suffocated the undesirable fleas, we searched through his wet fur and found an astonishing 13 adult fleas still on him. Gross. So point is, BE PROACTIVE. After 3 days, 3 baths, continuous lemon/vinegar spraying, Yoda is flea-less. In the meantime, you need to vacuum, sweep, vacuum, and sweep. Wash your clothes, towels, sheets, pillows. And then spray them all down again. After a few days of hard work, you can finally relax and not have to worry. Just keep an eye on your feline*. Keep checking through their fur. *Cats can scratch up to 3 weeks after removing all the fleas. Why? Because they still have itchy scabs and bites from when the fleas invaded them. Just don’t mistake scratching for flea scratching! Also, don’t forget to consult our other article for more tips on ‘How to get rid of fleas on my cat‘! 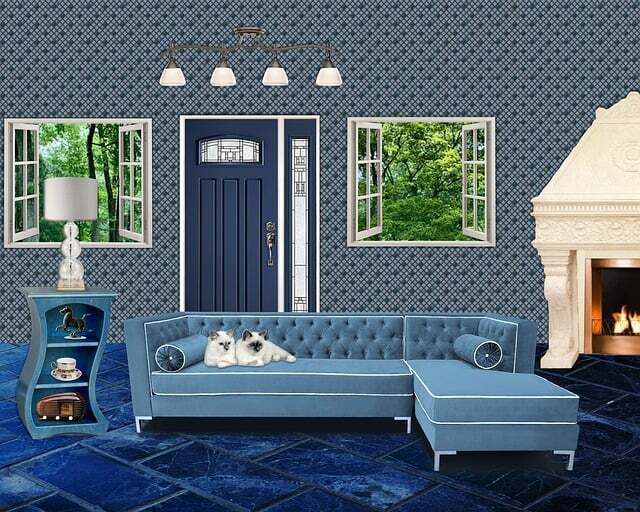 Thank you for consulting Fluffy Kitty in your search for a flea-free life! We found these recipes to be very useful and hope that you will too! If you enjoyed our article leave us a little comment below or follow us on Fb, Twitter, Instagram, Google+ and Pinterest! See you next time! Oh, sorry to hear Michelle! Have you tried food grade diatomaceous earth? It’s meant to be pretty effective on fleas! I have had a hard time finding any home remedies that work good on pets. I agree going the natural way you have to use many different options as one seems to lose effect. You say add 1/3 vinegar to the solution. 1/3 of the spray bottle? it’s unclear 1/3 of how much? Hi Soren!! Thanks for pointing that out. Yes, 1/3 of the spray bottle. We filled up the spray bottle with boiled lemon mixture about 50%, the vinegar about 30% and plain water about 20 percent.